Post from April 4, 2017 (↻ August 6, 2017), filed under Philosophy. Another part of the series, here are some highlights from Wallace D. Wattles’s The Science of Getting Rich (1910)—you’ve come across them in a different format a few years ago. Success in life is becoming what you want to be […]. There is nothing wrong in wanting to get rich. The desire for riches is really the desire for a richer, fuller, and more abundant life; and that desire is praise-worthy. Desire is possibility seeking expression, or function seeking performance. A man’s highest happiness is found in the bestowal of benefits on those he loves; love finds its most natural and spontaneous expression in giving. The man who has nothing to give cannot fill his place as a husband or father, as a citizen, or as a man. It is a natural law that like causes always produce like effects […]. Nor is getting rich due to doing things which others fail to do […]. […] getting rich is the result of doing things in a Certain Way. Talented people get rich, and blockheads get rich; intellectually brilliant people get rich, and very stupid people get rich; physically strong people get rich, and weak and sickly people get rich. You may be the poorest man on the continent, and be deeply in debt; you may have neither friends, influence, nor resources; but if you begin to do things in this way, you must infallibly begin to get rich, for like causes must produce like effects. If you have no capital, you can get capital; if you are in the wrong business, you can get into the right business; if you are in the wrong location, you can go to the right location; and you can do so by beginning in your present business and in your present location to do things in the Certain Way which causes success. Nature is an inexhaustible storehouse of riches; the supply will never run short. Original Substance is alive with creative energy, and is constantly producing more forms. When the supply of building material is exhausted, more will be produced […]. The Formless Stuff responds to the needs of man; it will not let him be without any good thing. Original Substance moves according to its thoughts; every form and process you see in nature is the visible expression of a thought in Original Substance. As the Formless Stuff thinks of a form, it takes that form; as it thinks of a motion, it makes that motion. That is the way all things were created. The thought of a house of a certain construction, if it were impressed upon Formless Substance, might not cause the instant formation, of the house; but it would cause the turning of creative energies already working in trade and commerce into such channels as to result in the speedy building of the house. First, we assert that there is one original formless stuff, or substance, from which all things are made. All the seemingly many elements are but different presentations of one element; all the many forms found in organic and inorganic nature are but different shapes, made from the same stuff. […] To think according to appearance is easy; to think truth regardless of appearances is laborious, and requires the expenditure of more power than any other work man is called upon to perform. […] Every appearance in the visible world tends to produce a corresponding form in the mind which observes it; and this can only be prevented by holding the thought of the truth. […] we can create what we want to create; we can get what we want to have, and can become what we want to be. […] remember that extreme altruism is no better and no nobler than extreme selfishness; both are mistakes. […] if you are to become rich in a scientific and certain way, you must rise entirely out of the competitive thought. You must never think for a moment that the supply is limited. […] Never get afraid that you will lose what you want because some other person “beats you to it[”]? That cannot possibly happen; you are not seeking [anything] that is possessed by anybody else; you are causing what you want to be created from formless Substance, and the supply is without limits. […] you need not hesitate to ask largely. Gratitude alone can keep you looking toward the All, and prevent you from falling into the error of thinking of the supply as limited […]. There is a Law of Gratitude, and it is absolutely necessary that you should observe the law […]. […] if your gratitude is strong and constant, the reaction in Formless Substance will be strong and continuous […]. You cannot exercise much power without gratitude; for it is gratitude that keeps you connected with Power. The moment you permit your mind to dwell with dissatisfaction upon things as they are, you begin to lose ground. You fix attention upon the common, the ordinary, the poor, and the squalid and mean; and your mind takes the form of these things. […] to fix your attention on the best is to surround yourself with the best, and to become the best. […] faith is born of gratitude. The grateful mind continually expects good things, and expectation becomes faith. […] It is necessary, then, to cultivate the habit of being grateful for every good thing that comes to you; and to give thanks continuously. You must form a clear and definite mental picture of what you want; you cannot transmit an idea unless you have it yourself. […] all you need is to know what you want, and to want it badly enough so that it will stay in your thoughts. […] it is the things you do not really care about which require effort to fix your attention upon them. See the things you want as if they were actually around you all the time; see yourself as owning and using them. Make use of them in imagination just as you will use them when they are your tangible possessions. Dwell upon your mental picture until it is clear and distinct, and then take the Mental Attitude of Ownership toward everything in that picture. Take possession of it, in mind, in the full faith that it is actually yours. Hold to this mental ownership; do not waiver for an instant in the faith that it is real. And remember what was said in a proceeding chapter about gratitude; be as thankful for it all the time as you expect to be when it has taken form. The man who can sincerely thank God for the things which as yet he owns only in imagination, has real faith. Your part is to intelligently formulate your desire for the things which make for a larger life, and to get [this] desire arranged into a coherent whole; and then to impress this Whole Desire upon the Formless Substance, which has the power and the will to bring you what you want. In order to get rich you do not need a “sweet hour of prayer”; you need to “pray without ceasing.” And by prayer I mean holding steadily to your vision, with the purpose to cause its creation into solid form, and the faith that you are doing so. When you have formed [your vision], it is well to make an oral statement, addressing the Supreme in reverent prayer; and from that moment you must, in mind, receive what you ask for. Live in the new house; wear the fine clothes; ride in the automobile; go on the journey, and confidently plan for greater journeys. […] Imagine an environment, and a financial condition exactly as you want them, and live all the time in that imaginary environment and financial condition. It is as flagrantly wrong to coerce people by mental power as it is to coerce them by physical power. Doubt or unbelief is as certain to start a movement away from you as faith and purpose are to start one toward you. It is by not understanding this that most people who try to make use of “mental science” in getting rich make their failure. […] you cannot hold the mental image which is to make you rich if you fill your mind with pictures of poverty. […] If you want to help the poor, demonstrate to them that they can become rich; prove it by getting rich yourself. […] Use your will power to keep your mind off the subject of poverty, and to keep it fixed with faith and purpose on the vision of what you want. You must learn to see the underlying truth in all things […]. […] there is only wealth. […] you do not need to read any other book upon the subject. […] read only the most optimistic comments on the world’s news; those in harmony with your picture. […] you can only get what is yours by giving the other man what is his. Whatever your action is to be, it is evident that you must act now. And do not spend time in the present taking thought as to the best course in possible future emergencies; have faith in your ability to meet any emergency when it arrives. If you are ever to begin to make ready for the reception of what you want, you must begin now. Do not bother as to whether yesterday’s work was well done or ill done; do today’s work well. Do not try to do tomorrow’s work now; there will be plenty of time to do that when you get to it. It is probable that your actions, at least for some time to come, will be those you have been performing for some time past […]. Hold the vision of yourself in the right business, with the purpose to get into it, and the faith that you will get into it, and are getting into it; but act in your present business. […] Your vision of the right business, if held with faith and purpose, will cause the Supreme to move the right business toward you […]. You can advance only by being larger than your present place […]. There never would have been new species had there not been organisms which more than filled their places. There is, however, a limitation or qualification […]. It should be the work of your leisure hours to use your imagination on the details of your vision, and to contemplate them until they are firmly fixed upon memory. If you wish speedy results, spend practically all your spare time in this practice. You can get rich in any business, for if you have not the right talent for you can develop that talent […]. […] you will get rich most satisfactorily if you do that which you want to do. Doing what you want to do is life; and there is no real satisfaction in living if we are compelled to be forever doing something which we do not like to do […]. The best way, generally, to change business or environment is by growth. When you get out of the competitive mind you will understand that you never need to act hastily. No one else is going to beat you to the thing you want to do; there is enough for all. […] When you are in doubt, wait. Remember that in the moment you begin to hurry you cease to be a creator and become a competitor […]. […] the key-thought of all your efforts must be to convey to their minds the impression of increase. The desire for increase is inherent in all nature; it is the fundamental impulse of the universe. All human activities are based on the desire for increase […]. Take an honest pride in doing this, and let everybody know it; and you will have no lack of customers. People will go where they are given increase […]. […] The desire to rule for selfish gratification has been the curse of the world. The mind that seeks for mastery over others is the competitive mind; and the competitive mind is not the creative one. In order to master your environment and your destiny, it is not at all necessary that you should rule over your fellow men […]. […] if you can give increase of life to others and make them sensible of the fact, they will be attracted to you, and you will get rich. Do not wait for an opportunity to be all that you want to be […]. […] remember that your thought must be held upon the creative plane; you are never for an instant to be betrayed into regarding the supply as limited […]. Whenever you do fall into old ways of thought, correct yourself instantly […]. Do not spend any time in planning as to how you will meet possible emergencies in the future, except as the necessary policies may affect your actions today. You are concerned with doing today’s work in a perfectly successful manner […]. No matter how tremendous an obstruction may appear at a distance, you will find that if you go on in the Certain Way it will disappear as you approach it […]. Never speak of the times as being hard, or of business conditions as being doubtful. When you make a failure, it is because you have not asked for enough; keep on, and a larger thing then you were seeking will certainly come to you. […] you will develop all the talent that is necessary to the doing of your work. Spend most of your leisure time in contemplating your vision, and in cultivating gratitude, and in reading this book. He must keep in mind the Purpose to get rich through the realization of his mental image. […] He must give to every man a use value in excess of the cash value he receives, so that each transaction makes for more life; and he must so hold the Advancing Thought that the impression of increase will be communicated to all with whom he comes in contact. […] the riches [men who practice these instructions] receive will be in exact proportion to the definiteness of their vision, the fixity of their purpose, the steadiness of their faith, and the depth of their gratitude. 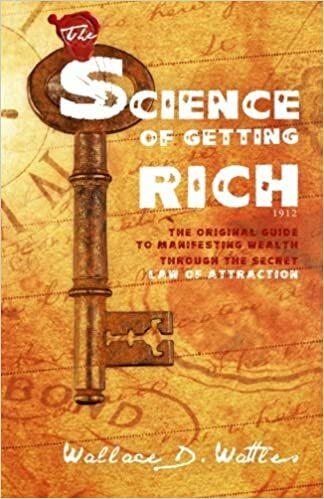 Read the whole book: The Science of Getting Rich .